Chris graduated from the Horizon CDT in 2016, and was awarded an internal CDT impact grant to investigate the preliminary findings of a recent Nottingham University Business School research project examining the big data that has been produced through student use of the Ingenuity Online platform. 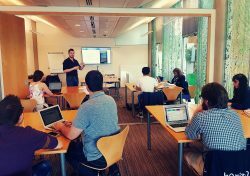 Since 2015, the Ingenuity Online (IoL) system has been integrated throughout various entrepreneurship education programmes and competitions run by the Haydn Green Institute of Innovation & Entrepreneurship, some of which have involved Horizon CDT students. The platform has been used by over 1,100 individuals to create more than 52,000 ideas and generate solutions for almost 1,800 identified problems. Preliminary work has indicated considerable potential not only in terms of analysing these existing data trails of group-based creative problem solving, but also for collecting further data from 2017/18 student cohorts and beyond, to examine links between entrepreneurial activity and the under-researched concept of collective intelligence. high quality academic research publications. demonstrating evidence of links between online collaborative decision-making and measurable entrepreneurial outcomes. informing changes in the design of the system, towards becoming a technically and ethically sustainable research tool. Demonstrate sufficient research impact to support a subsequent substantial research funding proposal based around analysing the IoL data. This goal is underpinned by three key objectives. First, to use big data analytical techniques with the IoL dataset to better understand online collective intelligence and its predictive capabilities in relation to entrepreneurial action. Protocols for accessing and cleaning this data have already been established by CDT student Georgiana Avram, as part of the aforementioned project and while preliminary analysis has been conducted on a single case study, up to 70 additional cases are available for extended analysis. Collect new data from MSc, MBA and PhD students joining in September 2017, utilising the embeddedness of IoL within the HGI’s entrepreneurship programmes and competitions. Studies will collect data via a combination of online (IoL) and face-to-face research methods (e.g. surveys and interviews) to further examine the effects of collective intelligence in relation to entrepreneurship. Use the findings to inform design, both in terms of how teams can be matched in future modules and competitions to optimise entrepreneurial outcomes, and with respect to the IoL system itself (e.g. introducing research ethics-focused T&Cs, integrating online survey functionality, and adding new variables of research interest such as socio-demographic user details).